positive return on investment -a predictive financial return on investment (FROI) exercise suggested that the FROI of the NSW pilot was positive for all sites and generated a NSW FROI of 5.14, meaning that every £1 invested would anticipate a saving or costs avoided of £5.14. Of these costs avoided, 89% were anticipated to benefit the local authorities. The obvious question is ‘What Next?’ The SCIE states only that its report “… is aimed at other local authorities or commissioners interested in learning how a NSW approach can improve outcomes, have a positive impact on social worker’s skills, confidence and motivation and reduce costs”. In the current circumstances, ‘reduced costs’ may be the biggest selling-point. The author of this blog post of course remembers when his own autistic son had a designated social worker. But the local authority cancelled this offer – to save costs (and to give me the joy of repeating myself over and over again in future conversations with duty social workers in the ’emergency team’). I will try to keep you updated. 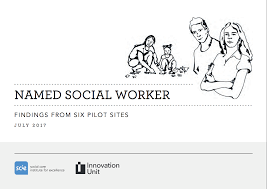 Posted in Blog | Comments Off on Evaluation of Named Social Worker (NSW) Pilot concluded. What next?